"Squid and zucchini is a typical pairing in Italian cuisine. Try this pasta dish and you'll see why! [Recipes originally submitted to Allrecipes.it]"
Bring a large pot of lightly salted water to a boil. 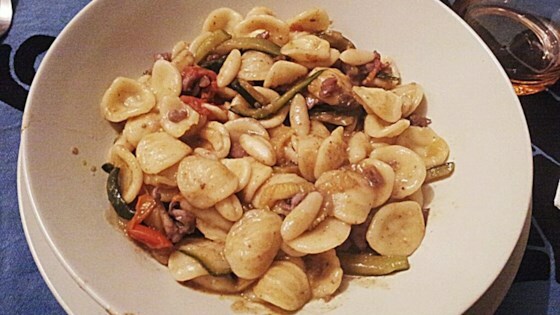 Cook orecchiette in the boiling water until tender yet firm to the bite, 3 to 6 minutes. Drain, reserving 1 cup cooking water. Heat olive oil in a saucepan over medium heat. Cook shallot in the hot oil until soft, about 5 minutes. Stir in squid; cook until coated with oil, about 2 minutes. Pour in wine; simmer until reduced by half, about 3 minutes. Stir tomatoes and zucchini into the saucepan; season with salt. Cook until softened slightly, 5 to 8 minutes. Stir orecchiette into the saucepan. Cook until coated with tomato and zucchini mixture, adding reserved cooking water a little at a time to make a moist sauce, 2 to 3 minutes. Garnish with parsley and black pepper. The sauce should cook only for 10 minutes in total: this way the zucchini will remain crisp and squid won't become chewy. If you don't have fresh orecchiette, replace with dry orecchiette or any other kind of short dry pasta, such as macaroni, penne, or fusilli. A few tips to cook pasta perfectly, as Italians would do: Use a large amount of water, around 1 quart per 4 ounces of pasta. Add the pasta only when the water is boiling; stir, then bring back to the boil, stirring from time to time. Cook 1 minute less than the time suggested on the packet; drain and reserve some of the cooking water. Add the pasta to the sauce and finish cooking, adding some of the reserved water as needed. Serve straight away! Also, never rinse pasta; you'll lose the starch needed to keep it moist.